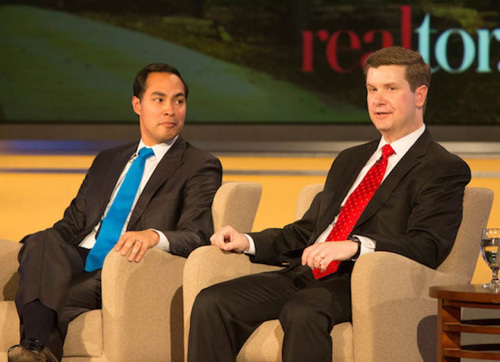 On October 26, the Trachtenberg School, GW School of Business and the National Association of Realtors hosted a conversation with Julian Castro, Secretary of the U.S. Department of Housing and Urban Development, which challenged the millennials stereotype. The conversation highlighted Millennials’ reluctance to enter the housing market as less a shift in mindset and more a reaction to challenging economic forces. The role of macroeconomic policy was a central theme during the panel discussion featuring Secretary Castro along with Realtor.com Chief Economist Jonathan Smoke and The Wall Street Journal Economics Correspondent Nick Timiraos. For students in attendance, the conversation hit particularly close to home. For a generation that is shying away from careers in government, opportunities for students to meet federal policymakers and see how their work influences everyday Americans are invaluable.